What to Know About Nesting Raccoons. The black-masked critters roaming your yard or nesting in your attic have definitely earned their description as “bandits”. 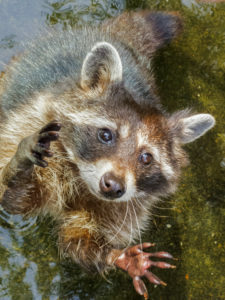 Raccoons are a cute-looking species with their black and gray striped coat, bushy tail, and their distinctive face mask. However . . .
First and foremost, never attempt to remove raccoons on your own. They are wild animals and will protect themselves the same as you would do if cornered. It’s best to contact a NJ pest control professional to evaluate the situation, provide options, and/or humanely remove the raccoons to a more suitable location. Raccoons are usually most active at night but they have been seen out and about during the day. When nesting, they look for quiet, dark, and secure dens, which could be under the house, in the attic, or in a shed or garage. They’ll eat anything available, including grubs, and for the most part only need access to water and a safe place to raise their young. Their babies aren’t mobile for at least eight weeks, so if raccoons have set up a nest anywhere on your property, chances are mom won’t be able to move her babies any time soon. With an inspection by a NJ pest control specialist from Stern Environmental, we can address your situation safely, and that includes removing nuisance raccoons. Give us a call and schedule an appointment to put an end to your raccoon problem.